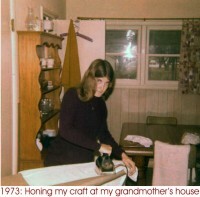 At the risk of shocking you, I’m just going to come right out and say it – I like to iron. Oh sure, I know what you’re going to say. It’s the same thing everybody always says: "Good. You can come over and do mine!” But I don’t want to do yours, or anybody else’s for that matter. So don’t even ask. It’s nothing personal. All I’m saying is that ironing is, well, it’s sort of like being a mother. There are just certain things you do for your own kids that you would never dream of doing for someone else’s. Case in point: I would never say to another woman’s child, "Here, just spit it out in my hand”. By the same token, there’s only one man whose trousers I feel comfortable turning wrong side out – and that’s all I have to say on the matter. But enough about why I don’t want to do your ironing – I’m here to talk about why I do want to do my own. Contrary to its reputation for being tedious and boring, the truth is that of all the domestic chores on the planet, ironing is by far the most underrated in terms of personal satisfaction and enjoyment. 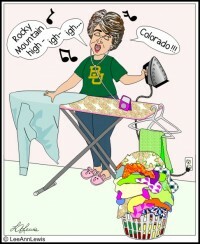 For instance, ironing gives me the perfect opportunity to catch up on all those TiVo’ed episodes of "America’s Got Talent”, not to mention an excuse to jam in a pair of ear buds, crank up the volume on my iPod and start belting out songs at the top of my lungs! Oddly enough, under any other circumstance, such an ear-splitting, slightly off-key, one-person-harmony rendition of "Rocky Mountain High” might elicit Cease and Desist orders from my husband, but because these concerts tend to result in half a dozen freshly pressed sport shirts that have been "missing” for three months, he usually deems such torture to be an excruciatingly painful but small price to pay. And while we’re on the subject of garments that haven’t been seen for a while – I say show me a woman who hasn’t occasionally fished around in the bottom of her ironing basket and come up with a strapless sundress in the dead of winter, or a pair of Capri pants that she outgrew ten pounds ago, or a maternity top she wore while carrying a baby that is now in kindergarten, and I’ll show you a woman who no doubt washes the drip pan under her refrigerator on a regular basis, has a standing appointment to have her cat’s teeth cleaned every six months and never gets invited out for Bunco night because no one can stand to be around her. In short, the tendency to put off ironing is not only universal, it’s downright American, and I’m proud to say that my procrastination skills are second to none when it comes to this particular chore. But the remarkable thing is that once I run out of excuses not to do it (inclement weather, a shoe sale at Macy’s, something caught in my teeth, etc.) and finally break down and haul out my ironing board, I find that it can actually be quite a rewarding task. In fact, with the possible exception of eating Ben and Jerry’s Mud Pie ice cream straight out of the carton, I’d be hard pressed (no pun intended) to come up with anything that offers me greater instant gratification. Here’s how the whole thing unfolds (again, no pun intended): I retrieve a wilted, crumpled, heretofore unrecognizable wad of fabric from the pile, place it on the board, spray it with starch, and glide my nice hot iron slowly across the surface. What lies in the path of this wonder appliance is a pitiful mass of limp wrinkles and creases. But behold! What flows in the wake of that same appliance is nothing short of a pristine paper-crisp miracle. Instantly, the flawed becomes flawless, the imperfect becomes perfect, beauty is bestowed upon ugliness – and I did it! I may be helpless to do anything about the wrinkles on my own face, but when it comes to annihilating the wrinkles from a pair of khaki walking shorts, I’m a power to be reckoned with! So stand back folks, and prepare to be impressed (okay, this time, pun definitely intended) because as soon as I polish off this carton of Mud Pie ice cream, I’m fixin’ to get in there and do some serious ironing. But I’m still not going to come over and do yours. So don’t even ask. Search for Chores articles similar to "More Pressing Matters. Search all articles similar to "More Pressing Matters".